There are special moments happening every day throughout UCLA Health. 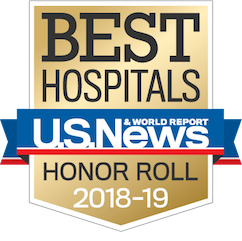 Whether you are a patient or family member who has experienced our care, or a staff member who would like to thank a fellow colleague, we want to hear from U! I agree to allow UCLA Health to share my care compliment with the individual being recognized, their supervisor, and in internal communications with leadership. 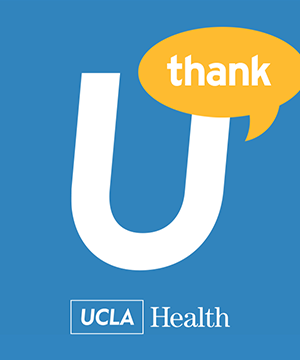 By clicking here, I allow UCLA Health to post my care compliment on this website using my first name. Once you have scrolled to the bottom of the terms box, the "Submit" button will be enabled. •	Use of the content you supply does not violate this Agreement and will not cause injury to any person or entity. •	Contains any computer viruses or other potentially damaging computer programs or files. 8. PATIENT STORYSUBMISSION. All contents that you submit may be used at UCLA’s sole discretion. UCLA reserves the right to change, condense or delete any content on UCLA’s website that UCLA deems, in its sole discretion, to violate the content guidelines or any other provision of this Agreement. Stories are generally posted within two to four business days. However, UCLA reserves the right to remove or the refuse to post any submission for any or no reason, in its sole discretion. You acknowledge that you, not UCLA, are responsible for the contents of your submission. None of the content that you submit shall be subject to any confidentiality obligations on the part of UCLA, its agents, subsidiaries, partners, or third party service providers and their respective directors, officers and employees. UCLA does not guarantee that you will have any recourse through UCLA to edit or delete any content you have submitted. However, you may request UCLA to remove your post from the Site but you must do so in writing and submit it to the following email address: connect@mednet.ucla.edu. 9. PATIENT ADVISOR APPLICATION.By submitting your application expressing your interest in becoming a UCLA Health Patient Advisor, you agree that UCLA may contact you to inform you about patient advisor opportunities, including, but not limited to electronic surveys about your opinions regarding UCLA Health services, invitations to participate in meetings, events, or committees designed to improve the patient care services of UCLA Health. You further agree that submission of a Patient Advisory application does not guarantee that you will be contacted to participate in any meetings, events, or committees. You may at any time request not to be contacted as a Patient Advisor by contacting the UCLA Office of the Patient Experience at 310-267-9113. * Please note that your message will be viewed by UCLA Health staff members for processing and delivery. Messages deemed inappropriate will not be delivered.